Did you have a good Christmas? I had the time of my life, and came away with better loot than I have had in a while. Swag included a Coloured Raine eyeshadow palette, a 40x jeweller's loupe, new trainers, books, a new jacket, and more. But all that is for another time; I'm too lazy to take photographs today. 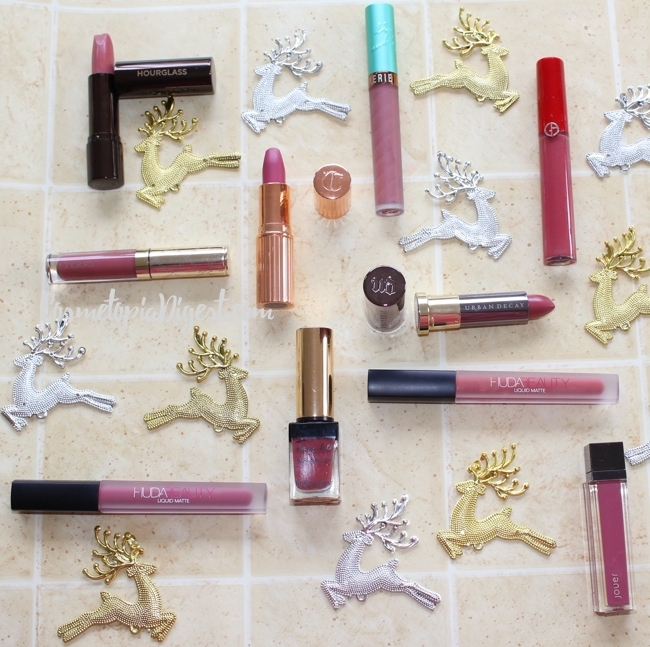 Now that the year is almost done, I thought I would talk about my favourites - this year has clearly been all about liquid lipsticks, with brands coming out with new, non-drying formulations. I hope the trend continues well into 2017! Scroll down for deets on 10 of my favourite lipsticks from 2016. Reviewed here. Top marks for these. They smell good, are very lightweight and runny, stay on beautifully and don't dry as much as the other matte liquids listed. Reviewed here. Whipped mousse texture, which is what makes these different. Versailles is the perfect subtle pinky-neutral shade. Reviewed here. Smells of tropical fruit. Started the light, not-flat-drying liquid lipstick trend which has been all the rage through 2016. I also recommend Dulce de Leche and Petale de Rose. Reviewed here. Velvet, yes, but not matte. These dry satin. Not reviewed yet because I'm USELESS. If I had to pick one shade to wear for the rest of my days, it would be this one. It is the PERFECT dusty rose. Is not matte, but satin-matte. Lasts longer than bullet lippies but not as much as the liquids that finish matte, of course. Reviewed here. Shade-wise, I prefer last year's Amazing Grace to the Hot Lips range, but of the latter, I prefer Secret Salma - it's mauve. Reviewed here. My favourite bullet lipstick of 2016. Also, my current favourite creamy lipstick. Love, LOVE this shade. Unreviewed so far out of sheer laziness and ineptitude. If you like dusty rose lipstick, go for this one - not Rush (a tad too peachy); not Rapture (a tad too plum). Reviewed here. You get a generous 10ml; I ignore the cheek part and use this as a lip colour. It is neither matte nor long-wearing, but is a lip lacquer, a la Rimmel Apocalips. I like it far more than the much-hyped YSL Glossy Stains.